Catalina Regional Park is a long, narrow park that follows the Cañada Del Oro (CDO) Wash flood plain. The park is open from dawn to dusk. For questions regarding Catalina Regional Park, contact (520) 724-5246 and leave a message or call the NRPR main office at (520) 724-5000. Catalina Regional Park is a joint project between Pima County Natural Resources, Parks and Recreation and the Pima County Regional Flood Control District. Within Catalina Regional Park is a main north/south trail and other designated trails that are open for hiking, mountain biking, bird watching and equestrian use. This multi-use trail links to the CDO Wash and the 50 Year Trail. All off-trail activity is strictly prohibited. Areas of the park have been fenced to reduce illegal off-road motor vehicle activities, illegal dumping, and illegal wood cutting. The park will continue to be monitored by NRPR staff and Pima County Sheriff deputies. The 2003 Aspen Fire damaged a significant portion of the north side of the Santa Catalina Mountains resulting in flooding along the Cañada del Oro Wash in Catalina. Pima County provided relief to residents impacted by the flood by purchasing approximately 200 acres of damaged properties. Following this acquisition efforts where completed to remove damaged structures and overgrown vegetation and debris to create a natural resource park. In the past several years the county has acquired additional lands to expand the footprint of this natural resource park, including the addition of a 29-acre parcel in October of 2016. The 260 acres park along the Canada del Oro Wash is a regional asset that is managed as open space and for passive recreation activities. The county has installed wildlife drinkers on the property to enhance wildlife habitats. A wildlife pond has been developed into a wetland area for wildlife. The pond is a great area to observe some of the diverse wildlife within the park. 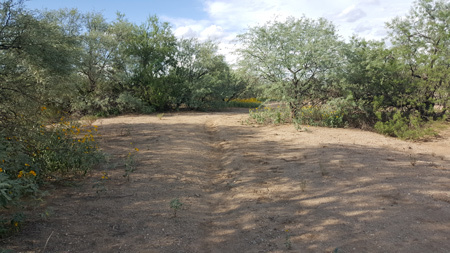 The county maintains and monitors groundwater wells on the property, has developed test plots to monitor various weed strategies, and has fenced livestock out of most areas of the park to further maintain and improve natural areas as wildlife habitat.